UMnu. Dumiso Dabengwa told the gathering that police are worse than former colonial ruler the late Ian Smith's security agents. A Bulawayo High Court on Thursday cleared Ibhetshu Likazulu to commemorate the Unity Accord and an end of atrocities committed by the North Korean-trained Fifth Brigade, which killed thousands of people in Zimbabwe’s Matabeleland and Midlands provinces while cracking down on so-called dissidents. Justice Francis Bere granted the order after police refused to give the Matabeleland group permission to hold a meeting at Stanley Square in the country’s second largest city, Bulawayo. The Unity Accord signed on December 22, 1987, by then PF Zapu leader Joshua Nkomo and Prime Minister Robert Mugabe, led to the end of the atrocities and incorporation of Zapu leaders into the Zanu PF government. Zapu leader, Dumiso Dabengwa, told members of Ibhetshu Likazulu and other local organizations at Stanley Square that the Zimbabwean police’s behavior is worse than what was done by former Rhodesian Prime Minister Ian Smith’s security agents. He said such behavior is unjustifiable in modern societies. 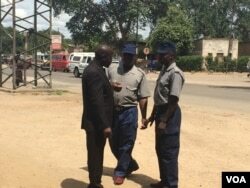 Police speak to a member of Ibhetshu Likazulu in Bulawao. Former Bulawayo council, Michael Bathandi Mpofu, added that there won’t be any peace in Zimbabwe as long as police behaved like agents of the colonial regime. His sentiments were echoed by several other people who attended the meeting.